Yang Donglan has had an unusual career trajectory. The 22-year-old once made a living selling cosmetics, but a year ago she switched her make-up brushes for nunchucks, undergoing a grueling training program to become a bodyguard. "I can go out with the bosses and see a lot of things. It's eye-opening," she told CNN. Yang completed a course at Tianjiao International Security Academy, a Beijing-based training camp founded in 2008 to train bodyguards capable of serving the growing numbers of China's elite. She had to crawl through mud in the freezing winter cold, learn to handle a firearm and stay awake for 24 hours in what she refers to as "devil training." "I didn't do a lot of exercise before and when I first started, I had trouble breathing while running but I eventually caught up," she said. Chen Yongqing, the academy's founder and former bodyguard, said he spotted an opening and decided to jump on what has become a booming market. In 2013, China had 317 billionaires (in U.S. dollars), second only to the United States, according to a ranking compiled by the Hurun Report, a Chinese version of Forbes' rich list. "We not only give our bodyguards physical training, they are also provided training on things like wine tasting so that they can communicate effectively with their bosses," he said. "They not only serve as bodyguards, but sometimes as a boss' personal assistant." Chen says that the number of female students is on the rise, adding that woman bodyguards have an advantage over their male counterparts, particularly as the number of female millionaires and billionaires increases. "Female bodyguards are more appealing to female employers or family members of male employers," he said. Yang says that employers prefer female bodyguards because they don't stand out. "It's easier for us to hide. People don't realize we are bodyguards," she says. "Some guys are really tall; you can easily tell that he is a bodyguard. Also, girls tend to be better at taking care of people." She is reluctant to divulge any details about her own boss, saying "loyalty is everything" in her job. The training, which last for three weeks and costs up to 12,800 yuan ($2,100), is not for the faint-hearted and attracts women from different backgrounds. Recent graduates Xu Si and Zhang Min both aspired to join the military when they were younger, but worked in sales and teaching before they became bodyguards. Xu describes the training as brutal. In the first few days, she had to crawl through mud and jump into freezing water. 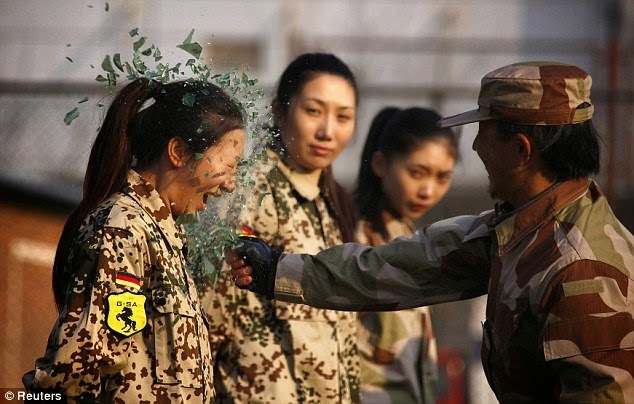 "I was trembling, and an 18-year boy quit in the middle," said Xu, adding that the other female recruits were her biggest encouragement. Others enroll simply for the experience. Dong, a white-collar professional who only gave her family name, told CNN that she hasn't decided whether she wants to be a bodyguard, but she believes the experience was valuable, allowing her to learn to be tough and persistent. Chen said that many factors had led to the increase of female bodyguards -- a low employment rate, good payment rates, and the chance to meet VIPs and have other eye-opening experiences -- but the most important, Chen said, was the growing confidence of women in China today. "Women today are more confident in taking careers that are usually perceived as male-dominated," Chen said. Contrary to popular belief, Chen says that fewer women quit the course than men. "Most of our girls stick it out to the end," he said. Yang has been working as a bodyguard for almost a year and says she has no plans to change to a different career despite the risks involved.